The region has also committed to attracting cleantech and renewable energy businesses. These companies provide innovative solutions that work to simultaneously protect and promote the region’s – and the world’s - ecosystems, resources and values. With an army of volunteers acting as custodians of our clean and green environment, the future of the Sunshine Coast is guaranteed to be environmentally and economically successful. Sunshine Coast Airport (MCY) located in Marcoola is serviced by Jetstar, Virgin Australia and Qantas domestically as well Air New Zealand who provide seasonal flight services (July – October) from Auckland. Mooloolaba is a short ten minute drive (12km) from the Sunshine Coast Airport and there are a range of transport options available including shuttle buses, hire cars, taxis, and public bus services. Multiple daily direct services operate from Sydney and Melbourne to Sunshine Coast Airport with Qantas, Jetstar and Virgin Australia. 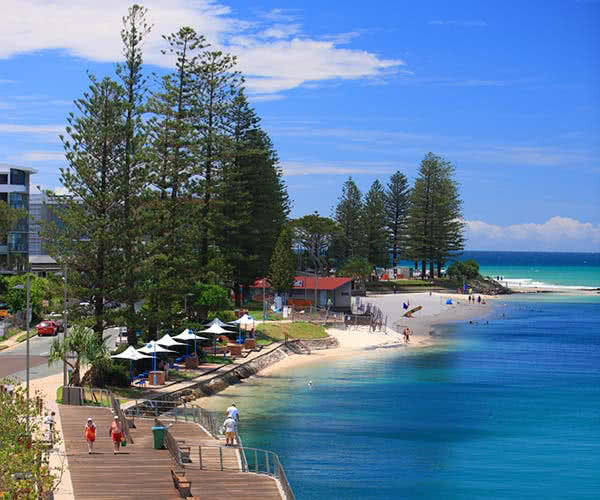 Three times weekly services also operate between Adelaide and the Sunshine Coast with Jetstar. Visit the Qantas, Jetstar or Virgin Australia websites to book. For flight arrival and departure times, transport options and traveler information visit the Sunshine Coast Airport website. Air New Zealand operates a regular seasonal service from Auckland to the Sunshine Coast during the winter months, providing direct access to the destination for international visitors. Visit the Air New Zealand website for information on connections and to book your flight. Alternatively, Brisbane Airport is both an international and domestic gateway to Queensland and is approximately a one hour drive from Caloundra. A railway line connects the region to Brisbane in the south, and Gympie and beyond, to the north. Interstate coach operators operate daily bus services to Brisbane where connections are made to the Sunshine Coast. Check out Local transport for more information on public transport to and around the Sunshine Coast. The Sunshine Coast is easily accessed as a self-drive destination. Located about 100 kms north of Brisbane along the Bruce Highway. All major car rental companies are represented at both the Sunshine Coast Airport and Brisbane Airport. The 2019 National Clean Technologies Conference and Exhibition will take place at The Events Centre Caloundra (20 Minchinton Street, Caloundra QLD 4551). Taxi - The Events Centre Caloundra is only 30 minutes drive from the Sunshine Coast Airport. There is a taxi rank located in front of the arrivals hall of the terminal. To make a booking or to discuss any special requirements you may have, please contact Suncoast Cabs on 131 008. Uber - Uber also operates on the Sunshine Coast! Click here to get a fare estimate. Climate - With more than 300 sunny days a year, the Sunshine Coast boasts an ideal year-round climate and supports an active, outdoor lifestyle. The enviable climate sees each season blend seamlessly into the next with daytime temperatures hovering between 15 and 26 degrees. For further information about the Sunshine Coast’s weather, click here. Pre and Post Touring - Extend your visit to explore the Sunshine Coast, explore the lush hinterland villages of Montville and Maleny, enjoy the pristine Caloundra beaches and much more. Click here to review #VisitSunshineCoast’s Official Visitor and Event Guide (PDF Download). Exclusive Offer - The Sunshine Coast is a welcoming place and would love for delegates to stay a little longer to experience the region. To entice you they've put together some great deals exclusive to NCTCE conference delegates.